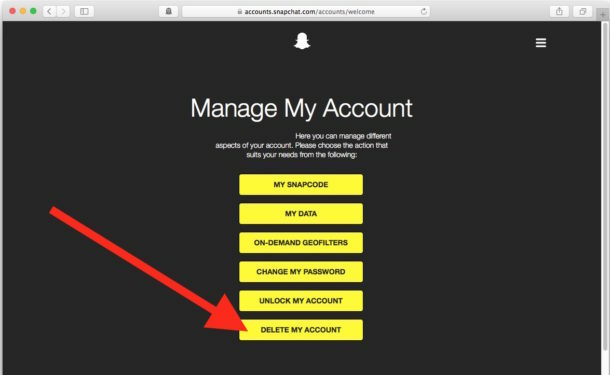 Want to delete your Snapchat account? Welcome to the club! OK but really, if you want to permanently delete your Snapchat account you’ve likely looked around in the Snapchat app and gone nowhere, that’s because you have to go through a series of steps to deactivate and then delete an account on every teenagers and millennials favorite service. 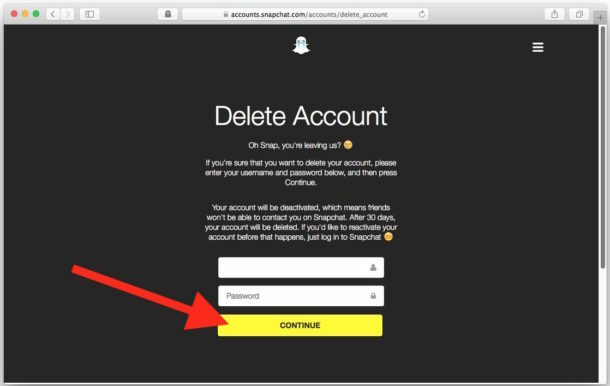 We’ll walk you through how to permanently delete any Snapchat account. Well, in 30 days anyway. In the meantime, the Snapchat account will be unavailable to receive any messages or pictures or other Snapchatty snaps. That’s right, the Snapchat account is first deactivated and unusable, and then you have to wait 30 days to delete a Snapchat account. It deletes itself automatically at the 30 days, the Snapchat account will be completely removed once that time hits. Why is there a 30 day delay to delete a Snapchat account? That’s the way it is. Presumably this is to allow ample time for impulsive teenagers to reverse their decision of deleting a precious Snapchat account, since you have up to 30 days to reactivate and reenable the account again, which can be done simply by logging back into the Snapchat account at any time during that 30 day window. And yes that means if you delete the Snapchat account this way, then open the Snapchat app and log back in, it will reactivate with a little notification on the app. That means if you want to delete the Snapchat account yet again, you’d have to go through the aforementioned steps via the website. If you do have the patience to wait out 30 days however, the Snapchat account will be permanently deleted, including the username associated with the account. No more Snapchat for you! Oh darn, right? I bet you will really miss it. 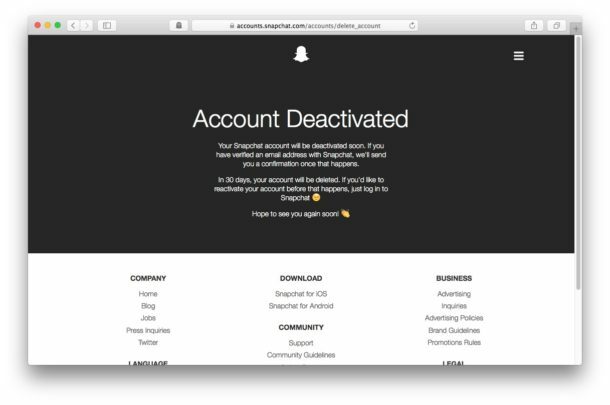 Now that you’ve deleted your Snapchat account, you’ll probably want to delete Snapchat app itself as well. Just tap and hold on the Snapchat app in iOS then tap on the little (X) icon to delete it and uninstall the app from the iOS device, it only takes a few seconds to do that. If you only delete the Snapchat app but don’t delete the account, the account will remain active with the Snapchat service. And yes you do have to use the website to delete a Snapchat account, if you fish around in the app you can spend as much time as you want to and you’ll never find a way to delete or remove an account from there, it must be done from the Snapchat website. Snapchat has the most confusing app I have ever seen. I deleted it. I don’t get it. I think I am old. Thank you so much for this. This app is a useless and begging to not to leave :D. why they hide this buttons. UGH!